You suffer a work injury and go to an urgent care/occupational health center(either directly after the injury or after being referred by the emergency room staff). Most of these occupational health centers have connections with hospitals or tie ins with companies and employers. In work related injuries initially diagnosed as “soft tissue” injuries such as strains, sprains, cuts, bruises etc., the doctors, after the initial exam, usually and promptly release the injured worker to return to work with temporary restrictions. 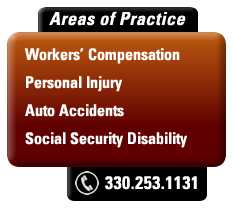 Many times these restrictions prevent the injured employee from retuning to his/her regular position of employment. Under the law, the employee must present these restrictions to the employer. If the employer can reasonably and safely accommodate the restrictions and make such work available within the physical capabilities of the employee, then the employee must return to work. Some employers make it a policy to accommodate work restrictions, even if it means making up a light duty or sedentary job such as sitting in the office answering phones or performing basic clerical activities. If there is a collective bargaining union contract, procedures for accommodating restrictions may be in the contract. If the employer is unable to accommodate the restrictions, then the Ohio Bureau of Workers Compensation(BWC) should be notified immediately(the employer should confirm with the BWC its inability to accommodate the restrictions). The physician of record(POR) in the workers compensation claim notifies the BWC of the restrictions by submitting a MEDCO-14 form. The injured worker, in turn, must complete and file a form. If the BWC determines that the injured worker is temporarily unable to return to his/her former position of employment due to the allowed conditions in the claim they should begin paying the worker temporary total compensation(TTC). In the case of a self-insured employer, the employer can begin to directly pay temporary total compensation. However, there can be “gray areas” when it comes to work restrictions. What if the employer orally advises the employee that it has a job position which can accommodate the restrictions but the job duties are vague or the employee is not sure whether he/she can perform the duties and activities of the job? If the employee does not accept the job offer and if the employer wants to contest further TTC, it must, under the ohio workers compensation rules, give a written job offer to the injured worker at least 48 hours prior to initiating proceedings. The written job offer must identify a description of the duties required of the position and clearly specify the physical demands of the job. The written job offer must then accompany the employer’s motion filed with the Industrial Commission to terminate TTC. If the employer has a representative or a well-trained management familiar with the workers compensation requirements, the written job offer will often be provided at the time the oral job offer is made with a copy given to the attending physician. If the doctor “clears” the injured worker for the modified job and the employee still refuses to return to work, the employer might send a letter to the employee advising him/her that unless they report to work by a certain date, the injured worker will be terminated from employment. Sometimes, employers will not send out a “warning” letter but simply advise the employee that his/her employment is being terminated. In either case the employer will not only contest further payment of TTC based upon a refusal to accept the “bonafide” job offer but may also request termination of TTC based upon the employee’s voluntary abandonment of his/her former position of employment. The Ohio Supreme Court has previously held that a voluntary abandonment of the former position of employment(i.e.. the employee being fired through his/her’s own fault) is a bar to further receipt of temporary total compensation in the workers compensation claim. Some employers use a “bait and switch” tactic wherein they increase the physical demands of the job once the employee returns to work hoping that the employee will simply quit or will not show up to work without the attending physician increasing the restrictions. In either case, the employer can legally challenge the payment of any further temporary total compensation payments based upon the voluntary abandonment defense. If the injured worker does not quit, then the employer might also terminate employment based upon any other written work policies such as unexcused absence, excessive absenteeism or insubordination. If you are not already represented by an experienced Ohio workers compensation attorney, it is advisable to immediately contact an attorney if there are any questions surrounding a written job offer and prior to being terminated from employment. Previous post: Does Ohio BWC Have a Real Vocational Job Training Program for Injured Workers? Next post: Are Ohio Workplace Intentional Torts Against Employers Dead?